Danielle Creations D125 at 15x is probably the strongest makeup mirror on the market. Wow! 15x! We know of no other makeup mirror with magnification power as great as this one. The 15x magnification power is much greater than you can imagine and not suitable for most people. It is, however, suitable for extraordinarily fine work or for those with vision problems. This is not hype - the mirror is simply too strong for most people and it is the most frequently returned mirror in our selection. There is a $25 restocking fee for this mirror. The 15x side flips over to 1x regular view, and the LED lighting illuminates both the 1x and the 15x sides of the mirror. For the most critical work the 15x magnification can't be beat! This is a plug-in mirror standing 14.75" high on a weighted/padded base. The mirror section is 8.5" in diameter. Finished in Polished Chrome. DO NOT PURCHASE THIS MIRROR UNLESS YOU NEED AN EXCEPTIONAL DEGREE OF MAGNIFICATION. FIELD OF VIEW AND VIEWING DISTANCE OF 2" TO 3" IS TOO CLOSE AND MAGNIFICATION TOO GREAT FOR MOST PEOPLE. A $25 re-stocking fee applies to returns for this mirror. LEDs illuminate both the 15x and 1x sides of this mirror. 15x Magnification power flips over to 1x - no magnification. Silver backed glass mirror lens. 8.5" mirror frame diameter (6.25" viewing surface), and 14.75" overall height. Danielle Creations is a Division of Upper Canada Soap, now it its 40th year. It all started in 1969 with a hand-made bar of bayberry soap40 years later, this modest apothecary piece has led to the way to 40 years of success. Drawing upon the natural beauty and resources that the Canadian landscape offers clear Canadian waters, endless fields of botanical herbs, and natural minerals have been the secret and inspiration behind Upper Canada beauty products. Upper Canada Soap is committed to combining time tested traditions and ingredients with the latest in innovation and technology to bring customers nothing but the very best in bath and body care. Being 40 never looked so good. To incorporate the beauty and pureness of the nature around us into every product. To be committed to excellence, ingenuity and quality while maintaining the proven traditions and standards of a 40 year heritage. To provide products that enhance the well-being, delight the senses and deliver on their promised end-benefit. consumed by an incandescent (regular) bulb. Light for a LIFETIME? LEDs operate an average of 50,000 hours. • LEDs operate an average of 50,000 hours. • 33 times as long as a standard incandescent bulb. • 6.25 times as long as a standard fluorescent bulb. • More than six years of continuous 24-hour-a-day use. •Fluorescent bulbs are much cooler than incandescents, but still warm. •LEDs generate very little heat. These images are an approximation and may not be 100% accurate but they are useful as a basis for comparison. The image you will actually see in the mirror is dependent upon several factors in addition to magnification power; including the size of the mirror, the viewing distance from mirror, and the quality of the lens. 3x Face, Hair, and Neck 10" - 13" 16"
5x Face and Some Hair or Some Neck 8" - 9" 11"-12"
7x Part of Face 5" - 6" 6" - 7"
10x Eyes and Nose 3" - 4" 3.5"
There is no industry standard for specifying magnification power for makeup mirrors. This opens the door to a high degree of subjectivity on the part of manufacturers when they describe the magnification power of their mirrors. To ensure you're getting what you expect it is best to rely to the integrity of high quality makeup mirror manufacturers. Don't make the mistake of opting for the highest magnification offered. Most people are surprised to find how strong that might be. Many find the 15x and greater mirrors much too strong and the viewing distance of approximately 2 inches, much too close for comfortable viewing. For comparison purposes, most cosmetic-counter makeup mirrors have magnification powers between 3x and 7x. Our most popular magnification power is 5x. Indeed if you have vision problems or you have particularly critical tasks to accomplish, then you may want to opt for an extreme magnification makeup mirror. As an additional reference point: A jeweler's loop, used to inspect diamonds, is 10x power. Factors other than the magnification affect the quality of the image you see. The size of the makeup mirror is an important factor. When two makeup mirrors are compared that both have the same magnification, glass quality, and silver-back quality, the larger size makeup mirror always wins - both for image clarity and freedom from distortion. There is a simple reason for this. Magnification is achieved by shaping the glass to a convex lens. It is impossible to have zero distortion, but the center of the glass/mirror/lens is the point of least distortion. The larger the mirror, the larger the center, and the less apparent distortion. The quality of the glass and whether or not it's backed with pure silver or aluminum are two other important factors to consider. And finally the quality of the material used for the frame and other metal parts is important if the mirror is to be used in a humid location such near a shower or bath. Factors other than the magnification itself affect the quality of the image you see. The size of the mirror is an important factor. When two mirrors with the same magnification are compared, the larger size mirror always wins - both for image clarity and freedom from distortion. Tilt and Swivel: Every wall mounted mirror we carry both tilts and swivels. Swivel is usually 360° or close to it. Tilt is usually 15° up or down - sometimes more. A double-arm wall-mounted mirror has more capability than a single-arm mirror because in addition to rotating at the mirror pivot, you can also rotate through 360° or almost, at the elbow. Distortion: All magnification-mirrors distort the image. If they didn't, they wouldn't magnify anything. The reason for this is that the mirrors magnify by using bent glass to form a sort of lens which does the magnification. The larger the magnification, the greater the bend in the glass and the greater the distortion. The center portion of the mirror, at any magnification level, always has the least distortion. In a larger mirror, the absolute size of the center section is relatively larger, and therefore the area of least distortion is larger. This is the main reason a larger mirror is preferable. Expensive Mirrors: All of our mirrors are high quality mirrors, usually better quality than those found in big-box stores; both for image and finish. But some of our mirrors are dramatically more expensive than others. The reasons are manifold. The "expensive" mirrors have silver-backed glass forming the image, rather than aluminum-backed glass. The larger mirror sizes of the more expensive mirrors are much more difficult to produce correctly but once you've seen the difference in the larger image it's hard to go back. The plating on our Miroir Brot mirrors is thick and perfect, as is the finish itself - tiny imperfections are simply not present. Lastly, the expensive-mirror frames themselves are solid brass or triple-plated steel and heavily built - as these mirrors are often used in hotels and need to be able to take abuse. Fluorescent, Incandescent, or LED: The long and the short of this is that it's what you prefer that counts. All of our fluorescent-lighted or LED mirrors are so noted. Our mirrors use only color-corrected fluorescent lamps and LED lamps, which approximate daylight or indoor lighting - your choice in most cases. They do not have the green tinge of commercial indoor fluorescent lighting - which people find objectionable. (See full explanation below.) Even so, daylight is not always preferable. Light from incandescent lighting or "regular" light bulbs usually used indoors, is often preferred by many. A feature of modern fluorescent lamps is that greatly reduced wattage produces light output perhaps four times the wattage consumed - and the lamps stay cool. LED lamps consume even less electricity, stay cooler and last 50,000 hours on average. That's 6 years of continuous usage 24 hours a day, 7 days a week. Lighting color is measured in degrees Kelvin. Running through the spectrum, the higher the Kelvin temperature, the closer to pure white light. The light on bright sunny day with blue sky measures 5,600° Kelvin. A very bright day with a cloud-covered sky weighs in at 6,000° Kelvin. An incandescent (regular) bulb gives off light at approximately 3,200° Kelvin. This is quite yellow, as evidenced by photographs taken by lamp-light. But our eyes are used to the color and in most circumstances it looks normal if not pleasing. By contrast, most fluorescent lighting is a color called "cool white" used because it is the cheapest color to produce. Cool-white is 4,600° Kelvin and definitely green. Any photo taken under cool-whites looks green to the viewer. A color-corrected fluorescent used in our mirrors usually run between 5,000° and 5,400° Kelvin, and approximates blue-sky daylight. The closer to daylight color the more expensive the bulb. So where does this leave us? With the exception of cool-white fluorescent, most people find color-corrected fluorescent lamps and most LEDs agreeable, as they do regular incandescent lamps - it's purely a matter of preference. Switch on Base: Putting a switch on the electrical cord is the cheapest way to include a switch. 99% of our makeup mirrors do not have a switch on the cord - but have a switch on the base or mounting plate of the mirror. Hardwired Mirrors: Hardwired mirrors are intended to be installed by a licensed electrician and connected to the house wiring. All of our hardwired mirrors are marked "HARDWIRED" on the website. Also, all of our hardwired mirrors have a switch on the mirror itself, so your electrician need not install a separate switch. All of our hardwired mirrors have the switch on the base or on the mounting plate. No other switch is required. Also note that each of our hardwired mirrors tilts vertically and swings horizontally. NOTE: Hardwired mirrors, once connected electrically, are non-refundable. Gifts: Makeup mirrors make excellent gifts. 18k Gold or Brass are the best finishes for use in rooms other than bathrooms, while most bathrooms have chrome fixtures, and chrome-framed mirrors should be at the top of the list. Consider the situation at your recipient's home... their style and preferences, and whether or not they'd want a lighted or unlighted mirror; and if lighted and wall-mounted, whether it should be hard-wired or plug-in. Bulk Commercial Orders, and Hotels: Let us know what you need, by contacting customer service. Returns: In accordance with our Refund Policy most mirrors can be returned for a full merchandise refund provided they are returned according to our regular refund procedures. Custom-made mirrors are non-refundable except for manufacturing defects - extremely rare. Also non-refundable are hardwired mirrors that have been electrically connected. A restocking fee of $10 is required for all mirrors with greater than 7x magnification. 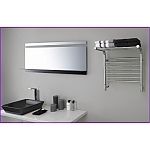 At PMM we carry only better to best mirror brands. These even the least expensive of our mirrors will exceed in quality, most of those found at "big-box stores." 99% of our makeup-mirrors are glass (i.e., not plastic) and those that are not are clearly specified. Similarly 99% of our lighted mirrors have switches on the base or mounting plate - not on the cord. Vanity-table mirrors all have padded, weighted bases. Aptations makeup mirrors including Kimball & Young, First Impressions, Clear Mirror, and Mirror Image makeup mirrors are an upper mid-priced line of high-quality Makeup Mirrors and come with a 3-year Manufacturer's Warranty. Finishes include Chrome, Gold, Brushed Nickel, Polished Nickel, and Italian Bronze. Magnifications run from 3x to 10x with many lighted, reversible, and hardwired mirrors as well as a many cool-running LED-lighted mirrors. Jerdon Style makeup mirrors are a mid-priced line that compares favorably with most in this price range. Exceptional values may be found in their quality mirrors. Miroir Brot mirrors are made in Paris France and hold the world standard for supreme quality. A Miroir Brot mirror is truly a luxury for those able to afford one. Each Miroir Brot makeup mirror is shipped directly to your door from Paris. Sharper Image mirrors have numerous clever and useful innovations in their line of high-tech makeup mirrors.